News & Documentary Emmy Award-winning, Elaine Quijano is a reporter, correspondent, and anchor. Quijano is currently working as a correspondent and anchor for CBS News. She appeared on CBS "This Morning" and "The CBS Evening News". Quijano is also anchoring the Sunday edition of CBS "Weekend News". Elaine Quijano was born in 1975 in the United States of America. Her mother migrated to the US from the Philippines. Her father is from Davao City, where a maximum of her family still lives. She grew up in the Skokie and Morton Grove suburbs of Chicago, Illinois. She earned a bachelor's degree in journalism in 1995 from the University of Illinois at Urbana–Champaign. Quijano started her career as an intern at WCIA-TV in Champaign, Illinois, in 1994, and later became a reporter/producer/anchor there. She left the WCIA -TV and become a general assignment reporter for WFTS-TV in Tampa, Florida in 1998, Quijano. After two years later, she joined CNN Newsource, an affiliate of CNN as a correspondent in December 2000. During her time at CNN, she has reported September 11, 2001, attacks. She went to Kuwait City shortly before the U.S. aggression of Iraq in 2003. She resided in Kuwait for about a month. Quijano also reported the 2003 Space Shuttle Columbia disaster and the Beltway sniper attacks. In 2004, Quijano joined CNN/US as a Washington, D.C.-based general assignment correspondent. She covered the Supreme Court, the campaign of vice presidential candidate John Edwards, the Pentagon, and the 2004 re-election campaign of President George W. Bush. She named a White House correspondent for CNN in 2006 where, Quijano covered major stories of the George W. Bush administration, including the War on Terror, the unsuccessful bid for comprehensive immigration reform, and the 2008 financial crisis. On December 23, 2003, she left CNN. Quijano joined CBS News in 2010 as a general assignment reporter. She has covered the 2012 Sandy Hook Elementary School massacre, Hurricane Sandy in 2012, the Boston Marathon bombing of 2013 and the 2014 World Cup. Quijano is an anchor for CBSN, the digital streaming network for CBS. Quijano is also anchoring the Sunday edition of CBS Weekend News where she has appeared on CBS "This Morning" and "The CBS Evening News". In 2016, Quijano was named by the Commission on Presidential Debates (CPD) as the moderator for the vice presidential debate on October 4, at Longwood University in Farmville, Virginia. Quijano, therefore, became the first Asian American to moderate a U.S. discussion for national elected office in the general election and the youngest journalist to lead a debate since 1988. It is also the first time a digital network anchor has been selected to moderate a national debate. Since Judy Woodruff, Quijano, 42, is the youngest journalist to moderate a debate on the national stage. She was awarded the News & Documentary Emmy Award for Outstanding Coverage of a Breaking News Story in a News Magazine. She was also nominated for News & Documentary Emmy Award for Outstanding Investigative Journalism in a Regularly Scheduled Newscast. In her spare time, Quijano loves to read books. She has a height of 5 feet and 6 inches and has a seductive body measurement 34-23-34 inches. Quijano has also active on the social media like Facebook, Twitter, Instagram. She has not revealed about her personal life on social sites however married rumors are speculated around the air. As far as her maritual status is concerned, Elaine Quijano is completely irrelevant. However, she once gave a hint having a husband, she never revealed any information about it. Going through her social accounts, Quijano do have a sweetheart. 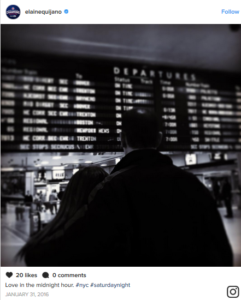 In photo uploaded by her in late 2016, which shows she and a man from behind with a caption that says: "Love in the Midnight Hour." An interview with Filipinas Magazin she revealed that "My mom came from humble beginnings. In the Philippines, as a little girl during World War II, she lost her dad in a US air strike against the Japanese, who had occupied a nearby village. He just didn’t come home one day. My mom was five, and as the daughter of a seamstress, and one of four young children, she wasn’t surrounded with opportunities for success. But she went to school, she grew up, and eventually graduated from college—no small feat when you stop and start your studies multiple times in order to support your family, and when your own mother asks, not with malice but with genuine confusion, “Why are you going to school? You’re just going to be a seamstress like me.” My mother was 28 years old when she finally earned her bachelor’s degree in accounting. That education allowed her to immigrate here to the United States, ultimately paving the way for my sister—an MIT graduate—and me". In 2009 Quijano spoke at her alma mater, the University of Illinois at Urbana-Champaign, about her mother’s tough upbringing.